Stefan Feld’s games are known for having an interesting mechanic at their heart, which is one of the reasons I look forwards to his games. 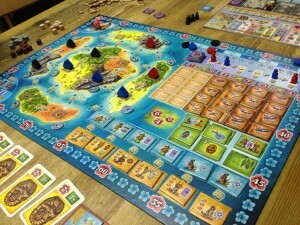 Bora Bora is no different and has a dice-placement-action system in the centre of a game that isn’t complicated but it does have a lot of other game mechanics and bits surrounding it. No specific aspect is complicated, but there is a lot going on, so I’m going to try to discuss each main part one-by-one. 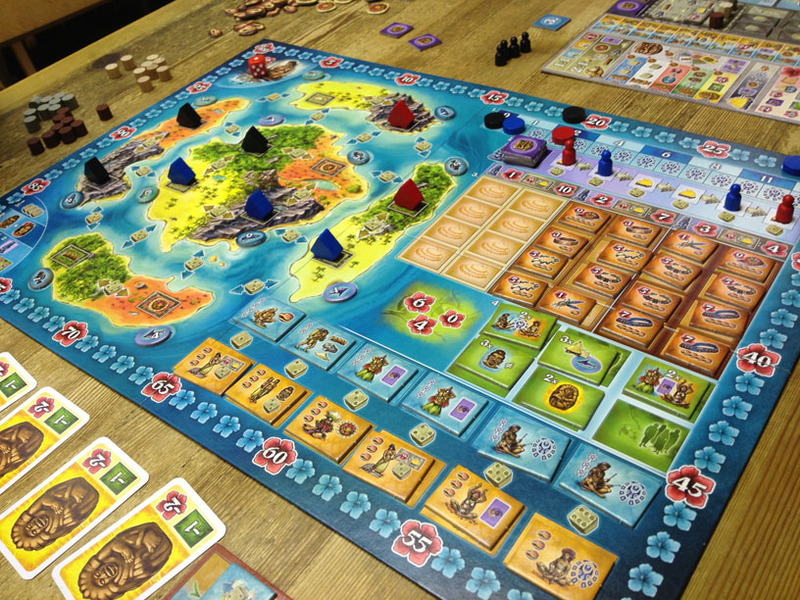 The game is set on a Pacific island and players place huts, gain tribe members, build buildings, make offerings to the gods, and so on. The game lasts 6 rounds and the winner is the player who finishes with the most victory points (VPs). Many VPs are earned during the game, but there are also lots of bonus VPs that can be awarded at the end of the game (although, as you’ll read later, these are quite tough to achieve).